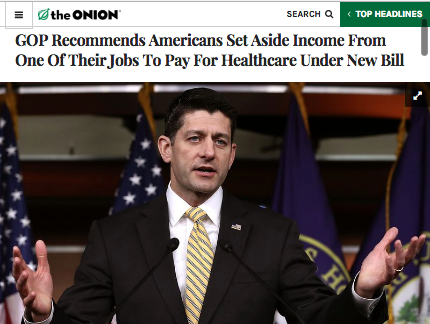 The Onion lifts the Orwellian veil and imagines Paul Ryan giving earnest and realistic advice, “GOP Recommends Americans Set Aside Income From One Of Their Jobs To Pay For Healthcare Under New Bill.” A liberal friend commented that “it sounds exactly like the kind of things Paul Ryan is already saying.” But this isn’t accurate: I went and listened to Ryan talking about healthcare, and The Onion describes what liberals hear when our media describes his policies, but it is not how he frames healthcare himself. The mock report sounds as if Paul Ryan spoke his truth: his policies and his values applied to the real world. It might ring true to liberals, but I've never heard Republicans nor progressive activists frame the Republican health care plan this way: with clarity, without exaggerations or team-identifying “#resist” hashtags, simply taking the values actually felt by Republicans to realistic conclusions. When Republicans frame healthcare, they avoid words about poorly-paid people working. In their world, "the poor" consume — for example iPhones — but in Republican stories they do not work. They certainly do not work two jobs. The Republican frame implies that work will set them free, and that less consumption will solve their problems, but the real lives of the working poor are never explored. The Republican conversations about healthcare use a lot of magic talk about how each step “will lower prices even more” without consequences. It's rare to hear liberals describe, in memorable story, how each money-saving step will leave someone hurting. Ryan’s discussions of health care never give recommendations to people on how they will adjust to the new plan. This Onion article is accurate — people with low-paying jobs will need to add another part-time job, perhaps stick their kids in front of the tv and hope for the best, to pay for their healthcare. It is also true to Republican values of hard work, where most of the liberal attacks pretend that Republicans, in their hearts, are motivated by something more evil. Why not say it? Why don’t Democrats and their allies describe the Republican plan as this article does: using the Republican plan and Republican values of hard work, and showing what this means in the real world. The Onion has lifted the Orwellian veil off the Republican plan, without adding mockery or opposition. They’re describing the Republican values of hard work in an unregulated market made manifest in the real world: and that true story is cutting comedy in a way that #resistance attacks are merely ephemeral shouts from people cheering for the other team. Democrats and allies should explore framing this way. Use active listening, be able to describe Republican values better than they can, be able to say the positive values that regular people are motivated by. Tell the story while adding neither our disparagement nor their Orwellian veil. Tell a story of healthcare that matches Ryan’s actual, undistorted beliefs, his desire for people to work harder, as it would really work. Don’t tell people what to believe. If people don’t come to the same beliefs you hold at the end of your story, revisit your beliefs or revisit your story. My Democratic feed has been full of numbers —not stories— of how many millions of people will lose health care. “Millions of people,” but no one with a name or a story. After all the abstractions, or sometimes before the abstractions, a few insults are tossed in. No Democratic frame takes each step of Ryan’s policies and explains, gives an example, of how each step that “will lower prices even more” takes away a needed service. If Republicans want a strong work ethic, what does this mean for a family who works at Republican-contributor Walmart? If they want cost savings, where will those savings come from? Be willing to admit the positives next to the negatives: yes, my healthcare costs went up under Obamacare because some people with pre-existing conditions were added to my pool and are now insured too. Don’t describe them just by income level: don’t say “People who make $40,000 per year.” Start with a story of people living their lives in a particular way. Pull listeners out of abstractions. Say: "this is what Paul Ryan wants a young couple where both parents work at Walmart to do." Don't exaggerate: describe a healthy person who will pay less at the same time you describe someone with a pre-existing condition who will lose their coverage. Leave no points for them to pick apart. Footnotes with numbers are great, but they're not the story. Unmuddle the Republican story — without any snark at all. Don’t call Paul Ryan whatever you think of him. Tell the story of what he believes and what he is doing. No paper tigers. None of your opinion. If your story doesn’t make people furious, your story needs work.